The Carb-Sane Asylum: Disabilesity ~ Part II: An Epidemic? Disabilesity ~ Part II: An Epidemic? This series was inspired by my own "journey" through what I'm going to call disabilesity. If you haven't done so and would like some personal background, read Disabilesity ~ Part I: Intro and My Own Journey. This installment is about increased risks and rates of physical impairment, preceding and including formal physical disability, that have coincided with the rising rates of obesity. A theme of this series is that unlike the chronic metabolic disease risks (diabetes, CVD, etc. ), the impairment of physical ability is often overlooked. In my opinion, this does a disservice, especially to younger obese individuals who are not properly educated/warned about these very real consequences. Most people don't die of things like osteo arthritis, but quality of life can be greatly affected. Take a look around the next time you go to a large grocery or department store. The number of handicapped spots seems to have multiplied in these parking lots. Sure, we have an aging population here in the U.S., but we're also in a day and age where if anything there should be fewer people requiring such spots, not more. Polio was, after all, eradicated, pharmaceutical alleviation of pain and inflammation has advanced significantly, and more effective remedies are available over-the-counter, and drugs effective in staving off debilitating rheumatoid arthritis and similar conditions. There have been advances in prostheses that have many formerly disabled now more able than some with intact limbs, and there are fewer casualties of war. So why the need for all these parking spots? While looking around, also note that most using these spots do not show up in specially equipped vans with wheel chairs. No, very often it is someone who simply has difficulty moving around. Whereas it used to be mostly elderly walking with canes and walkers and such, much younger folks are now seen requiring the complementary motorized carts to navigate these stores. Even many who ambulate will do so for a very short time between their vehicle and a shopping cart to use as an ersatz walker (I know this trick, I did this for around two years). 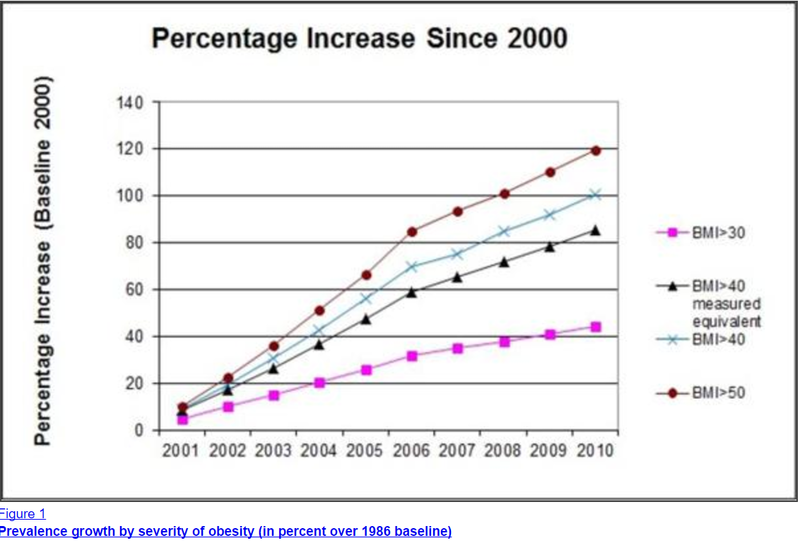 So why does it seem that physical disability is on the rise along with obesity rates? Perhaps because it is. At a minimum, obesity seems the most obvious cause of the phenomenon. The obesity epidemic denialists -- chief among them Health At Every Size founder Dr. Linda Bacon -- love to play with distributions and means to downplay the increasing proportions of the American population. Most of these arguments are based on overweight and/or mild obesity. This graph, of data from this study, tells another story. No mention of the impairment of physical abilities. So anyway, I find it interesting that the overweight category has stayed relatively constant at 40% for men and 25% for women. 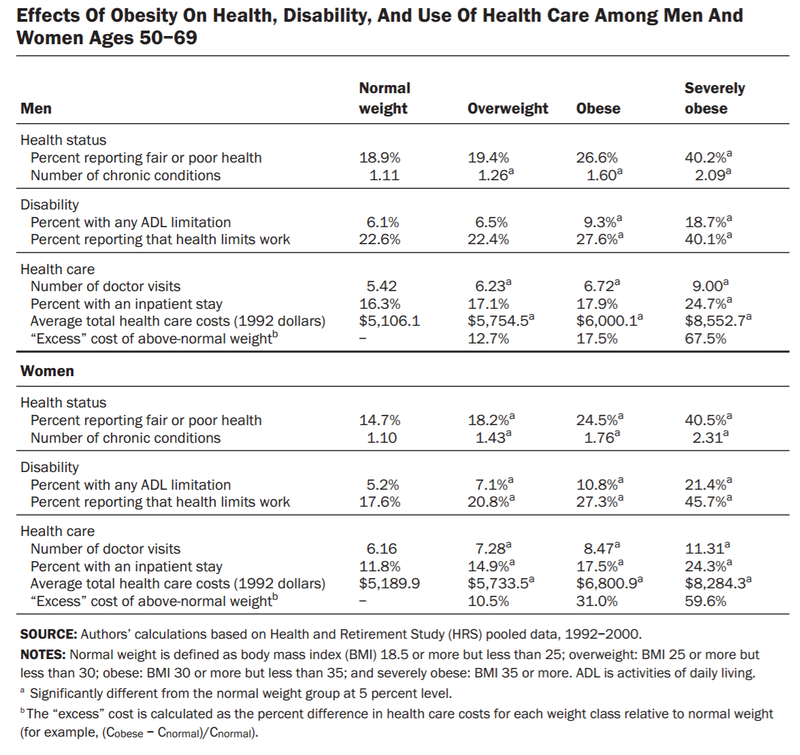 The higher rates for men may be related to the faulty nature of BMI, but the consistency is odd to me ... thoughts? In any case, it is extreme obesity where women outpace men 2:1 and where we are seeing steadily increasing rates despite some leveling off obesity in general. 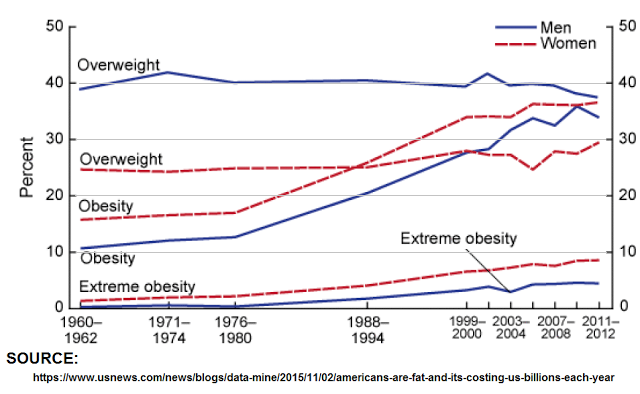 Another article, Morbid obesity rates continue to rise rapidly in the United States, paints an even more bleak picture. Even keeping in mind that percentage increases are "inflated" by the fact that there are smaller baseline rates at higher BMIs, but still, this image is cause for concern. In 2010 it was estimated that 6.6% of Americans, a little over 15 million, were extremely obese with a BMI over 40. I do believe that "just obese" is often a mischaracterization for many, and/or we have become so accustomed to some level of societal girth-spreading such that what would have been seen as obese in 1970 no longer appears so. 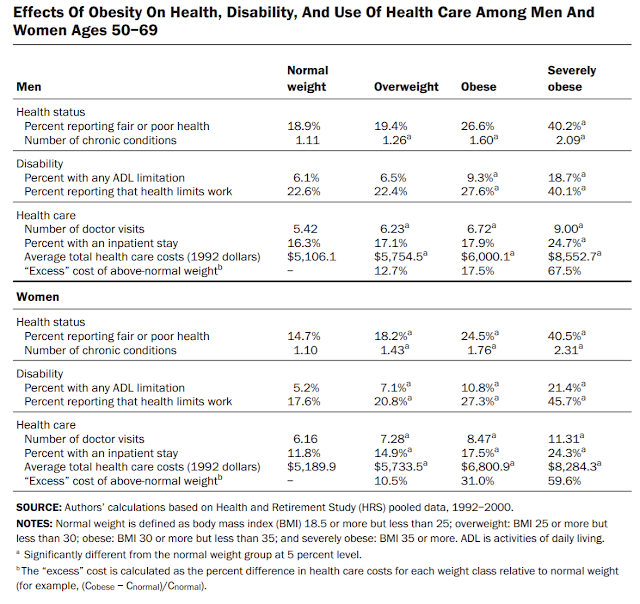 But there can be no doubt that severe obesity (often indicated by BMI over 35) and certainly extreme obesity (BMI over 40 and even BMI over 50) are going to have some health ramifications ... even if *only* in the physical sense. Meanwhile Bacon and her ilk love to throw around positive associations with "overweight" and mild obesity and experts are suggesting ball room dancing on a Fridays and dropping enough weight to ditch the seatbelt extender. Are The Young Becoming More Disabled? Rates of disability appear to be on the rise among people ages eighteen to fifty-nine, fueled by a growing obesity epidemic. From the second one I thought I'd share the following, and the disability stats do not include impairments further down the continuum of impairment that I've been discussing. Disk Degeneration and Low Back Pain: Are They Fat-Related Conditions? Sure, there are uncertainties addressed here as to the causal relationship between obesity and disability in an individual. 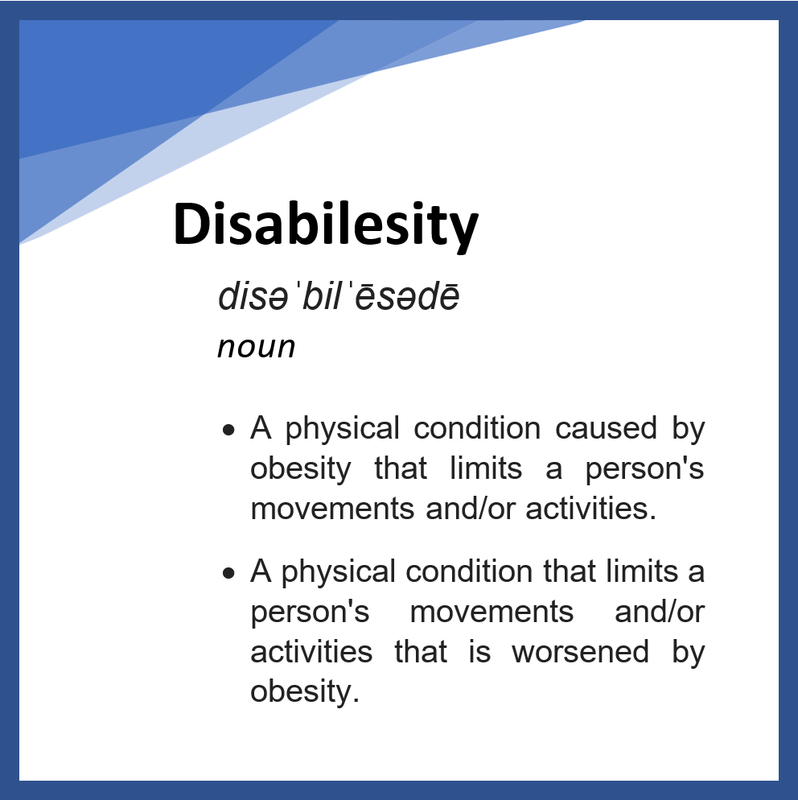 Certainly being rendered disabled by injury, thus sedentary, could plausibly lead to obesity, and surely is the direction for some individuals. But on the population level there doesn't seem to be a plausible cause for the rise in disability being an instigating factor in obesity. As I'm sure many will attest, there's a bit of a vicious cycle involved here at some point -- where weight gain can make impairment worse leading to even lesser activity and more weight gain, and round and round we go. If you have ANY pre-existing physical issue, excess weight can only make it worse. It may not. It may not do so in acutely perceptible fashion. One thing for sure, however, is that excess weight will never benefit this aspect of your health. So why don't we hear much about this? Sure ... as I've mentioned, osteoarthritis is included in the laundry list of increased risk factors associated with obesity. But in the hyperbole-dominated rhetoric surrounding this "disease", I contend that by the time most dealing with excess weight get to that point of the list, they're in full Seinfeld yada yada mode. Why? Because in their zeal to create a separate disease out of obesity by piling on, the medical establishment has gone quite a bit overboard. The over-reaching so that everything from the common cold to hang nails in an obese person is attributed to their weight has created a level of skepticism over all of the claims (fertile ground for the Bacons of this world to exploit). And arthritis? Eh ... a few aches and pains ... pop an ibuprofen ... no big deal. In the next part (or parts) I will talk about how the various factions of the Obesity Industrial Complex are "conspiring" to enable this trend to continue. Note, I used the quotes there because I do not believe there is any sort of coordinated conspiracy. Perhaps between some factions, but I believe it's more that each faction stands to profit or benefit from the obese in some way. By focusing on metabolic health, there's an uneasy atmosphere developing where younger obese are not being made aware of the long term risks to their physical health. Such impairments are easy to downplay, because they are both more difficult to quantify and generally not life-threatening. Also, such surgeries as joint replacements are far more commonplace to where many think "I'll just get a new joint". The problem is it's not all that easy, and it will be less so for an obese person (and at some point joint replacement is either not an option or a very risky one). The OIC is pretty good at playing one faction off of another to divert attention from their own complicity in ignoring physical disability (or in some cases other health outcomes in general). Having conditioned the obese to blame others, they will look to blame someone. It helps to get folks just angry enough at one faction, but not so angry as to cause them to hold anyone fully accountable. I contend the various factions benefit when there's enough confusion to spread the blame around and rile up "the masses" about being lied to. Using EasyHits4U you can earn free advertising credits by surfing other website-ads from a user base of over 1.2 million accounts. Earn credits fast with a view per view model.